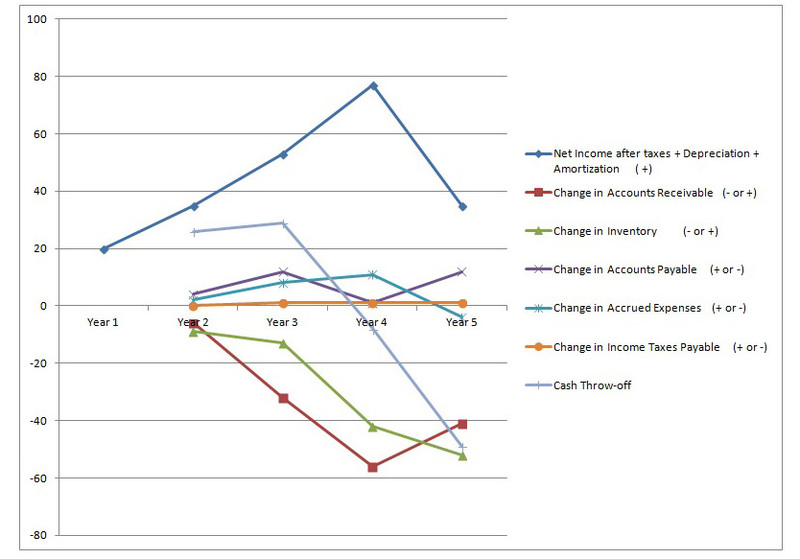 In this study, five years of balance sheet and income statement data from a fictitious company was used to construct the visual analysis to the left. The line graph shows the cash contributions and uses of the various financial components of the company. The graph clearly shows a declining cash flow trend starting at the end of year 3. Time increments can be any measurement even days if the data supports it. The Excel spreadsheet starts with inputs form the balance sheet and income statement and through a series of calculations and charts produces the final cash throw-off chart as shown to the left. The objective of this study is to show how a visual analysis of cash throw-off can be used to spot underlying problems such as excessive inventory levels, increasing receivables, declining profit margins, etc. The early detection of the overall change can be a warning signal that problems lie ahead and that adjustments need to be made.